Rolls-Royce has confirmed that completion of the sale of its fuel injector business, L’Orange, a wholly owned subsidiary of Rolls-Royce Power Systems, to Colorado-based Woodward took place on 1 June. The completion of the transaction, which was announced on 9 April, followed recent clearance from the German antitrust authorities. Net proceeds totalled €673 million after transaction costs and other adjustments and included a cash contribution reflecting 2018 trading prior to the date of completion. In 2017, L’Orange reported pro forma sales of €244 million, pro forma underlying EBITDA of €74 million, pro forma underlying operating profit of €64 million and pro forma post-tax free cash flow of €51 million. The results of L’Orange up to the date of completion will be classified as non-core in our 2018 results and the 2017 comparative will be restated to reflect this classification. L’Orange, based in Stuttgart, Germany, will remain an important partner and supplier to Rolls-Royce Power Systems through a long-term supply agreement, with an initial term of 15 years. Delta Air Lines and Los Angeles World Airports (LAWA) have announced a US$1.86 billion plan to modernize Terminals 2 and 3, together with the Tom Bradley International Terminal (Terminal B) at Los Angeles International Airport (LAX). LAWA is the governing body for LAX and Van Buys Airports. The project has been given the name Sky Way and construction is expected to begin in the fall. Delta also confirmed that new LAX facility will provide more security screening capacity with automated security lanes, additional gate-area seating, plus a world-class concession program in partnership with Westfield Corporation. oneworld® launches a new platform on May 4, for linking up to the world’s premier airline alliance – enabling customers to enjoy more services and benefits across an even more extensive global network. The first airline to join in the new capacity as a oneworld connect partner will be Fiji Airways. A date will be announced in due course for when Fiji Airways will start offering oneworld connect services and benefits. oneworld connect is the first new membership platform unveiled by oneworld since the alliance was originally announced 20 years ago. oneworld is in discussion with other carriers interested in participating in the programme, from various parts of the world including the Americas, Asia-Pacific and Europe. Each oneworld connect partner will need to have a minimum of three oneworld members as its sponsors to be initiated into the programme. The initial oneworld sponsors of Fiji Airways will be all four of oneworld’s original founding members - American Airlines, British Airways, Cathay Pacific and Qantas. The Australian carrier will additionally mentor Fiji Airways through its oneworld connect implementation process. American Airlines, Cathay Pacific and Qantas already code-share and have frequent flyer links with Fiji Airways. British Airways and Fiji Airways are currently discussing areas for potential bilateral cooperation. Bombardier has signed a letter of intent (LOI) for up to 18 Global 6500 and Global 7500 business jets with HK Bellawings Jet Limited, a leading aircraft management company based in Hong Kong. If all firm orders and options are exercised, the transaction would be valued at approximately US$1.14 billion based on 2018 list prices. This is the first of 21 A321neo aircraft ordered by the airline under its fleet renewal programme. Powered by Pratt and Whitney Pure Power engines, the new aircraft features a premium two class layout with 12 business class seats and 154 seats in the main cabin. Philippine Airlines will deploy the A321neo aircraft across the Asia-Pacific region, including Australia and India. Embraer’s Legacy 450 medium cabin business jet set a new speed record on a recent flight between Portland, Maine in the United States and Farnborough in the United Kingdom, according to the U.S. National Aeronautic Association (NAA). 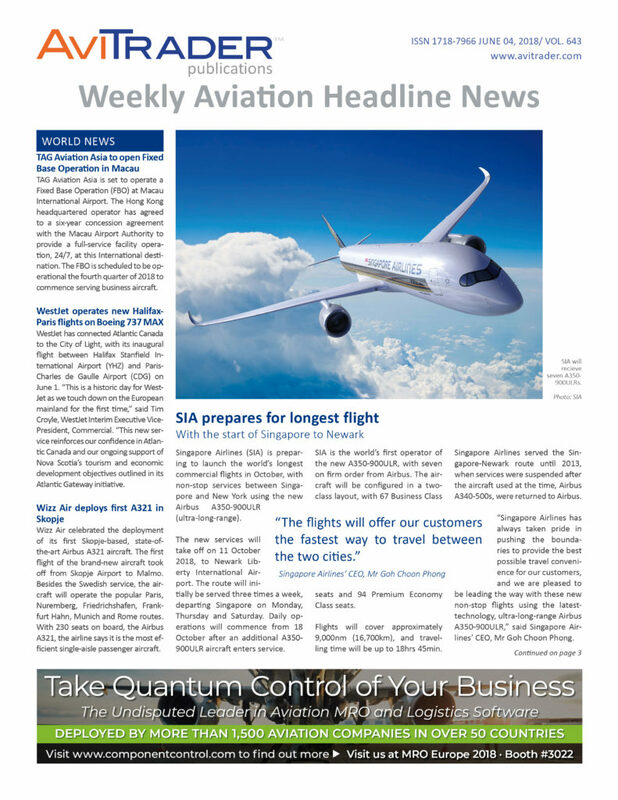 The record-setting flight occurred on March 7, 2018, with two pilots and two passengers on a ferry flight of Embraer’s new Legacy 450 demonstrator aircraft, which debuted at the European Business Aviation Conference and Exhibition (EBACE) in Geneva, Switzerland. The flight departed at 9:25 a.m. from Portland International Jetport Airport (KPWM) and landed at Farnborough Airport (EGLF) at 8:30 p.m., achieving an average speed of 521.89 mph (840 kph). The Legacy 450 landed with fuel reserves in excess of those required for NBAA IFR as well as for critical operations. The flight lasted six hours and five minutes, covering a distance of 2,756 nautical miles (5,105 km). The Legacy 450 has a full range capability of 2,904 nm (5,378 km) with four passengers and NBAA IFR Reserves, and it can operate at up to Mach 0.83 with an altitude ceiling of 45,000 ft.
BOC Aviation has agreed to purchase three new Boeing 787-9 Dreamliners from Boeing, taking the total number of this aircraft model in the Company’s fleet or on order to 14. All three aircraft have been placed on long-term leases with Air Europa, and are scheduled to be delivered to the airline in 2020. AeroVision International (Muskegon, MI) has named Jim McHugh as Senior Director of Sales. McHugh is a sales veteran with over 20 years of business development experience in all functions of large account management and operations. Prior to joining AeroVision International, he served as National Business Development Manager in the healthcare industry, providing extensive business development, sales training, strategic analysis and customer relationship management for organizations throughout the United States. McHugh and his team will be responsible for the growth and expansion of AeroVision’s parts, engines and aircraft segments. As the high demand for jet engines shows no signs of slowing down, one Connecticut manufacturer is rising up to meet the challenge. For over three decades Aero Gear in Windsor has been a key player in complex gearbox assemblies for the global aerospace market. Now the company continues to set a course for success as it completes a 24,000 ft² expansion of its facility. Rose points to the simultaneous growth of the commercial and military defense industries and their need for assembled gearboxes as a prime catalyst for increased production. Aero Gear makes the power drive gear systems for fixed and rotary wing aircraft. The mechanisms are as essential as the combustor that creates the thrust for the engine- the “brain” behind the brawn, and thus, require the highest quality precision engineering and manufacturing. The Royal Flying Doctor Service has announced that Air BP, one of the world's largest suppliers of aviation fuel products and services, has become their third National Partner.